Horrific conditions, but still catching fish! There has been a pattern developing recently with my charters. Run to get clean water and bait. Run back to pick up clients, then run back again to clean water! Yes its a lot of work but worth the extra hassle considering i am one of the few guides fishing and still catching fish. The bait of choice on my Fort Myers fishing charters this time of year is pinfish. The perception is always to get white bait or pilchards despite the time of year, i have found pinfish in the summer time more productive at finding good fish. White bait this time of year seems to get destroyed by the hoards of Snapper before a Redfish or Snook or Jack can eat it. The water where we’ve been fishing is mainly fresh water and consequently my clients have been asking if the water being “dirty” was because of the red tide. In this instance it isn’t actually dirty but rather is loaded with tannin acid giving it the appearance of being dark. 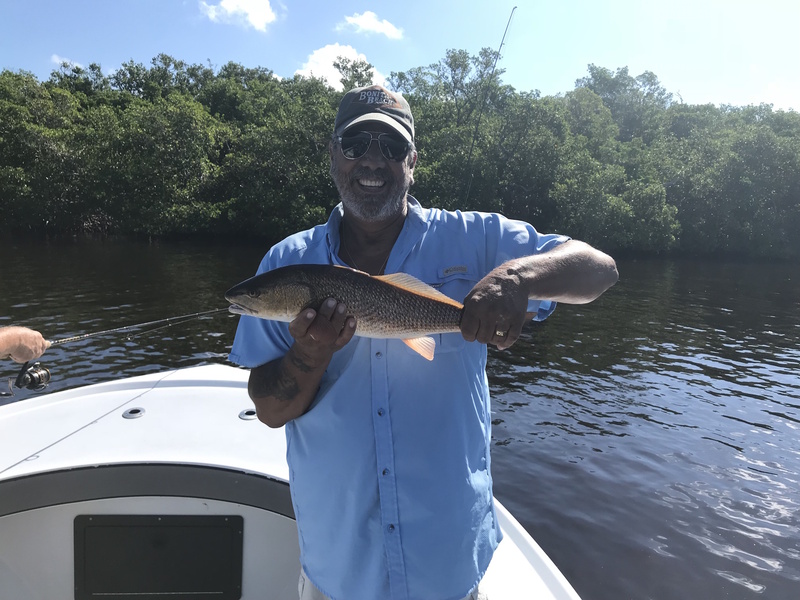 The fish caught on recent trips have been redfish jacks and snapper. Depending on the tide we’ve found them on mangrove shorelines as well as oyster beds and flats. Don’t let the challenging conditions scare you away from booking a trip with a guide of just going out and finding fish on the weekend by yourself.